Mainly building total body strength and sculpting your chest, abs, back and arms. Upgraded foam grips help minimize hand fatigue and non-slip desion help protect your floors no matter how intense your workout session is. 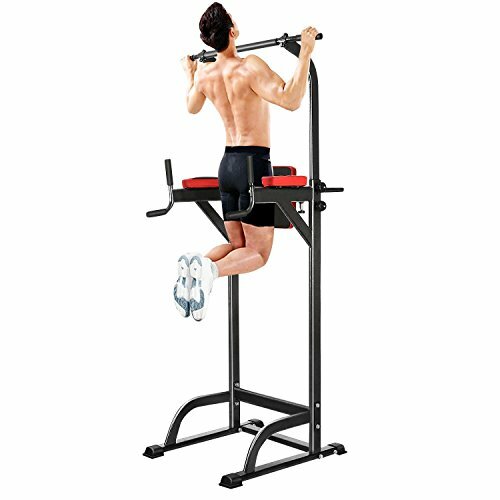 Multi-station&Function ---Pull-Up Station, Push-Up Station, Dip Station and Vertical Knee Raise (VKR) Station.Single Parallel Bars, Chin-Up, Arms Support, Main training abdominal muscles, arm, back, chest, shoulders and leg muscles.The power tower is suitable for men and women to build pretty body. Easy to assemble--- Easy to assemble and instructions included. An ideal choice for adults or children, fitness enthusiasts, the elderly exercise. Weight Capacity, 350 pounds. Measures 30.42 x23.35 x 70.2/89.7 inches (L x W x H).